The central figure is the Goddess of Mercy and she is surrounded by the stamps of each temple the owner has visited on his or her pilgrimage. In great condition. 590 mm’s wide and 1980 mm’s long. SKU: 13588. 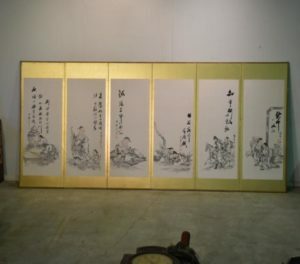 Categories: New Arrivals, Screens, Scrolls, Art.